Click the links below to listen to audio interviews with some of our authors from It’s Your Health radio. A new window will open and the audio will begin streaming. 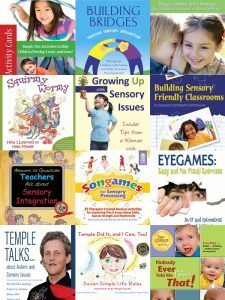 Interview with Roya Ostovar, author of The Ultimate Guide to Sensory Processing in Children: Easy, Everyday Solutions to Sensory Challenges. Shockingly, 1 in every 20 children experiences symptoms of Sensory Processing Disorder (SPD Foundation), affecting their ability to fully participate in everyday life. When sensory processing is impaired, lights can be too bright, sounds too loud, and clothes can actually be painful on the skin. In this book, neuropsychologist Dr. Roya Ostovar helps parents to help their children. She provides clear explanations, up-to-date research, step-by-step strategies, and case examples that bring her proven methods to life. Interview with Lynda Farrington Wilson, author of Squirmy Wormy: How I Learned to Help Myself. This is a wonderful little children’s book about a boy named Tyler, who has autism and SPD. Together with Tyler, the reader learns about SPD, and what everyday easy therapies he can do by himself feel better. For instance: “I feel like running really fast, run run run! Maybe I just need a s-q-u-e-e-z-e between the couch cushions like a hot dog. Whew! I feel better.” Endorsed by Dr. Temple Grandin, this book is sure to help many children, who perhaps previously did not even know they had SPD, lead calmer, richer lives. Interview with Britt Collins and Jackie Olson, co-authors of Sensory Parenting: Parenting is Easier When Your Child’s Senses are Happy! Temple Grandin, author of Thinking in Pictures: My Life with Autism and many other books, will be talking about her long-awaited movie Temple Grandin premiering on HBO in February. Interview with Paula Aquilla, co-author of Building Bridges Through Sensory Integration: Therapy for Children with Autism and Other Pervasive Developmental Disorders. Written by three experienced occupational therapists, this book offers a combination of theory and strategies. It is a perfect tool for those working with young children, but also broad enough to be adapted for older children and adults. Building Bridges provides creative techniques and useful tips while offering innovative strategies and practical advice for dealing with everyday challenges, including managing behaviors, improving muscle tone, developing social skills, selecting diets, and more. Interview with Dr. Lucy Miller, STAR Center Founder, Lucy has been expanding knowledge, fostering awareness and promoting recognition of Sensory Processing Disorder since 1979. She is the author of Sensational Kids: Hope and Help for Children with Sensory Processing Disorder, as well as co-author of the upcoming book, No Longer A SECRET.